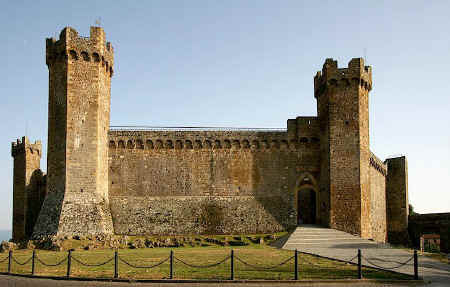 The castle of Montalcino is practically intact to this day. Its construction was begun in 1361 on the southern vertex of the 13 C city walls, incorporating the keep of S. Martino and the S. Giovanni tower. Il Castello di Montalcino looks much like a classic castle enclosure, based on a pentagonal plan with towers at the five angles. The southeast tower is located beside the keep. The walls and the towers have still practically the complete watch-walk of the machicoulis in stone, supported by rows of brackets shaped like inverted pyramids. The northern towers are open on the side facing the courtyard. The castle also incorporated a little, ancient basilica that became the chapel of the fortification, and its remains are still visible near the northeast tower. On the south side rises the mighty Medicean rampart, added by Cosimo in the mid-16 C.
The Sagra del Tordo (feast of the Thrush) festival takes place on the last weekend of October with drums, trumpets, costume parade etc on Saturday, followed by a day-long feast in Montalcino castle on Sunday. This feast of the thrush is open to the public and a good range of food, including roast thrushes needless to say, plus the excellent local wines are available. During the morning, there is another costume parade, and celebratory lunches are held in the four quartieri of Montalcino - Pianello, Travaglio, Ruga and Borghetto. Similar feasts are held in the evening. A limited number of visitors can book for these feasts - ask your host if you are staying in town. The main parade takes place in the afternoon, leading to the archery field, and is followed by the longbow tournament in which two archers from each quartiere compete. 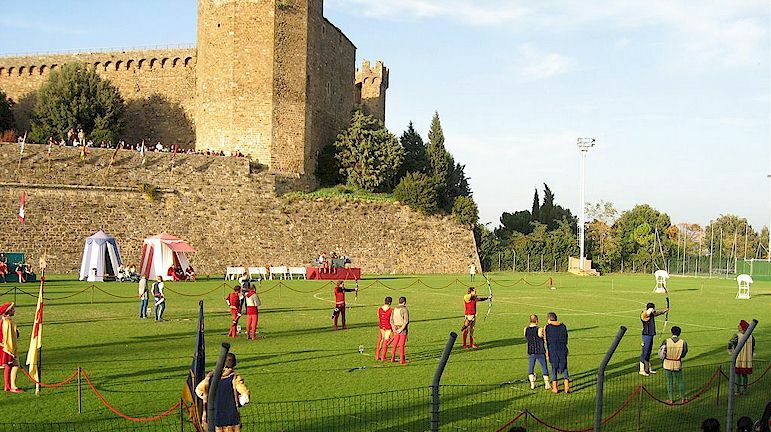 Tickets are required for the competition which a major annual event for the citizens of Montalcino. Unusually for Tuscany, the competition is for long bowmen although there are plenty of crossbows in evidence during the parades. Bus loads of tourists, mainly Italian, arrive on Sunday so if you plan to participate, arrive early or face a long uphill walk from where you park. Don't miss it - la Sagra del Tordo is not only about thrushes! • Full day private and shared wine tours from Florence and nearby to Chianti Classico wineries. Fixed prices offered. • Full day private and shared wine tours from Florence and nearby to Brunello di Montalcino wineries. Fixed prices offered. "Brunello di Montalcino" made its appearance in the middle of the 19 C, prepared by Clement Santi from a selection of Sangiovese Grosso grapes, the larger-berried clone of the Sangiovese variety. In Sienna in 1870, the first bottles of vintages 1863 and 1865 were exhibited as a superior ageing wine. Although the first great official vintage of Brunello di Montalcino dates back to 1888, until the mid-60s it was not well-known outside of its area of production. It began to be famous during the following ten years and became one of the most highly-rated Italian high quality wines. Over the years Brunello di Montalcino has gradually acquired greater fragrance, a more velvety flavour, a greater harmony and a delicately and intense bouquet. Today this dry wine is one of the best Italian reds. It's a strong, structured and tannic wine and it has got a very long life. The Biondi-Santi family remained the only producer of Brunello until after World War II and the estate only released the wine on rare occasions in the greatest vintages. Between 1888 and 1945, only four vintage declarations qualified. As recently as 1960, less than a dozen estates bottled Brunello di Montalcino but today there are 220 growers and over 150 bottlers (up from 100 in the late 1980s). The Consorzio of Brunello producers, incorporating virtually all of the winemaking estates, was established in 1967, just after Italian authorities declared Brunello one of the country's first DOC classified wines in 1966. This group plays a vital role in helping establish and administer production codes (by a decree passed in 2001, it actually controls production protocols for the zone down to the most basic details) as well as leading in the marketing and promotion of Brunello abroad. Unlike the consorzio in the neighboring Chianti Classico region, the group in Montalcino enjoys almost unanimous participation among the region's producers and has been quite effective in helping develop Brunello's reputation as a unique "brand." The "second wine" of the zone is Rosso di Montalcino and this generally sells for a modest price considering its high quality. One of the DOCG regulations which is strictly enforced entails "de-classification" of at least 30% of the production each vintage from Brunello, with its longer aging requirements, to earlier maturing Rosso, which is a DOC that must age for only a year prior to release. Because of the mandatory "de-classification", Rossos from a great house are often spectacular in a great vintage, and they can be extremely good in lesser years (when the house makes little if any Brunello, and uses its best grapes for Rosso production). For your vacation in Tuscany, stay in the cool Chianti hills - agriturismi, self-catering apartments with pool, villas, farm houses. Check our Greve in Chianti holiday homes web site. Vorresti pubblicizzare la tua attività su questo sito web per Montalcino e ricevere traffico in entrata dalla nostra rete di più di 50 portali relativi? Clicca qui per ulteriori dettagli in merito alla nostra soluzione integrata per una presenza su internet piena di successi. 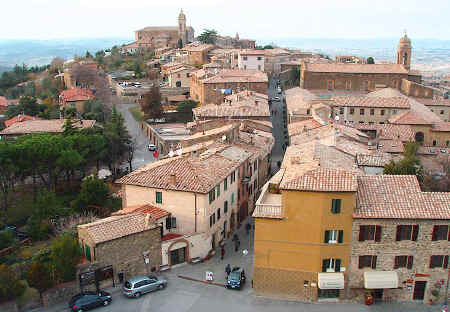 60 minutes west of Montalcino - stay among the authentic Tuscans! 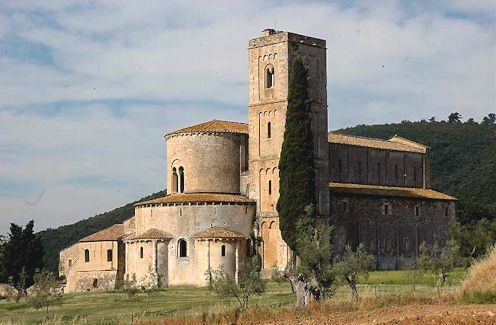 Two vacation apartments in Torniella, convenient to the Maremma, San Galgano and Siena. Click here for info about Casa Reasco - vacation apartments for 2 to 6 persons. Montalcino © ammonet InfoTech 1998 - 2018. All rights reserved.